Clever, amusing and perhaps a bit insensitive. The associated Facebook group has created something of a stir. Some people are petitioning that it is a hate group and should be taken down. I happen to like dark humour. Some people don’t. Where does one draw the line? Is the creator of this image seeking to denigrate the Irish? 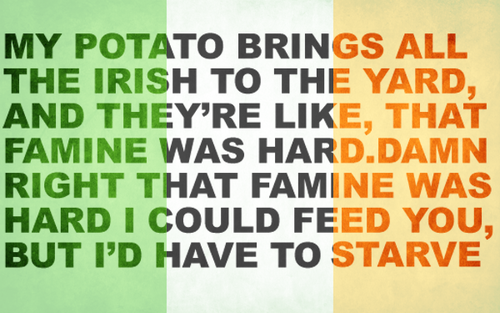 Or is the objective to play with a creative idea combining history, modern lyrics and a truism about the Irish famine? My view is that it is the latter. Come say that to my face you stupid WANKER and I´ll put you in your motherfucking grave. Dark humour my arse. You´re the one spreading hate. There is a massive difference between appreciating humour derived from a clever, but controversial concept and condoning immoral actions that caused the suffering of millions. Somehow this divergence escapes you. Instead of identifying the source of your anger and attempting to delineate it, you threaten and insult me. OK, I can pursue that route as well. How’s this? Go back to your cave and continue playing with your balls, you imbecile. Obviously, the football jersey you’ve worn since birth is cutting off the circulation to your brain. It might help to stop drinking cider all day long too. That might clear the head for rational thought. I haven’t received any education about this subject, and came across this flag. My unbiased reaction is the creator/poster is insensitive and crossed some line. My instincts tell me this is not dark humor, but insulting to many. Humor can be insulting, speaking of somebody’s baldness, accent, tastes in music or other, but this is beyond that. This is approaching the seriousness of racial jokes, about slavery and colored people. The creator/poster no doubt has racial issues and offends other cultures as well.